Forces loyal to Libyan leader Moammar Gadhafi are locked in a battle with rebel troops for control of Zawiya. The rebels had advanced into the city 30 miles west of Tripoli over the weekend, but there are signs the government forces have pushed them back. The battle marks a significant step for the rebels, who have been fighting Gadhafi’s government for more than five months and have seen a series of stalemates in the field even as their governing Transitional National Council has been boosted by diplomatic recognition from nations around the world. Also on Monday, Libyan Interior Minister Nassr al-Mabrouk Abdullah flew to Cairo with a handful of family members, leading to speculation about a high-level defection from Gadhafi’s government. “I think it’s becoming increasingly clear that Gadhafi’s days are numbered,” and pressure on him is increasing, said White House spokesman Jay Carney Monday. Read the full press briefing. 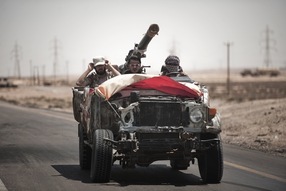 For up-to-the-moment developments in Libya (as well as Syria and Egypt), check out the Telegraph’s blog that compiles the very latest developments, tweets and photos here. Multiple threats to Libya’s stability and public order could emerge if the Qaddafi regime falls. Scenarios range from Qaddafi loyalist forces launching a violent resistance to internecine warfare breaking out among the rebel factions. This instability in Libya could lead to a humanitarian disaster, the emergence of a new authoritarian ruler, or even the country’s dissolution. The Economist looks at the conflict in Libya, and in other Arab countries, in this “cartographic chronicle” that looks at key players within the country, as well as in the Arab League in NATO, and how they influence the battle. Photo at top by Gianluigi Guercia/AFP/Getty Images. We’ll have more on the developments in Libya on Monday’s NewsHour. View all of our World coverage and follow us on Twitter.